Two more soldiers slipped down a mountain slope along LoC in Naugam sector of border district of Kupwara on the same day. SRINAGAR: The five army men, who are trapped under snow at two places along the Line of Control (LoC) in Jammu and Kashmir from last four days, are feared dead as chances of their survival are very remote. “Avalanche Rescue Teams (ARTs) of army are continuing the search operation to rescue the five army men trapped under snow at two places at Naugam and Gurez sectors along the LoC,” defence spokesman in Srinagar, Colonel Rajesh Kalia, told New Indian Express. He said the search and rescue operation is being hampered by the inclement weather and bad light. “Whenever the weather conditions improve, the ARTs resume the search and rescue operation,” Kalia said. 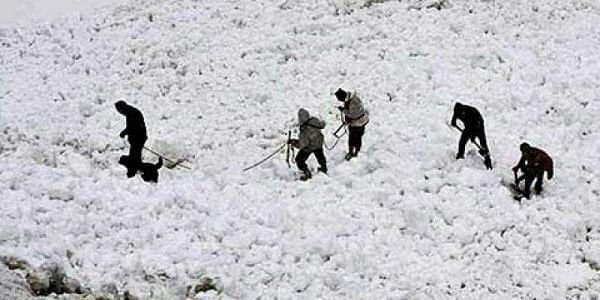 Three army men manning a forward post in Kanzalwan sub-sector of Gurez in north Kashmir’s Bandipora district were trapped under snow on Tuesday morning after coming under avalanche. “Since four days and three nights have passed after the soldiers were trapped under snow, the chances of their survival is very remote. The soldiers are now being feared dead,” an army official said. He said all efforts are being made to rescue the soldiers trapped under snow but with each passing hour, the hopes of finding the soldiers alive is receding. Sources said experts from Army’s High Altitude Warfare School (HAWS) have also been inducted into the two places to help the ART’s in the search and rescue operation. They said even if the soldiers are rescued from the snow, their chances of survival would be very low. They cited the instance of Lance Naik Hanamanthappa Koppad, who was rescued after being trapped under 25 feet of snow at Siachen for six days in February this year. “After being rescued from snow, he failed to survive and died four days later in army hospital in New Delhi,” they said. In January this year, 20 soldiers including four officers were killed in snow avalanches in Gurez, Machil and Uri sectors, close to the LoC in north Kashmir.